After an early morning drive through fog and mountains, Husband Walter and I arrived in Mendocino with dismal skies dimming gingerbread-trimmed structures to dull whites and pastels. The picturesque coastal town of my memory was at the northern limit of a West Coast trip we made years ago. On that trip, under sunny skies, we strolled all around the business district, the galleries and specialty shops located in structures of a bygone era. I had looked forward to repeating that experience even with my post-stroke walking that would be slower and more tiring. 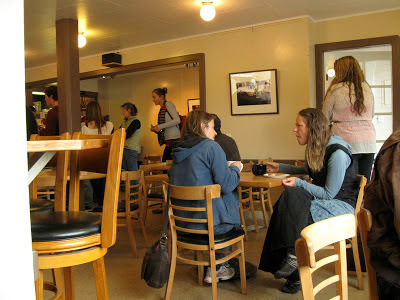 On this visit Hubby drove around until we spotted a likely coffee shop and bakery. 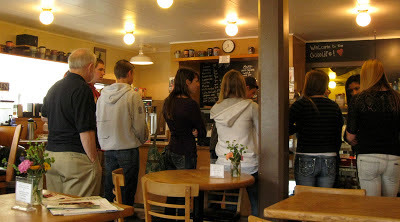 We were ready for our coffee, hot tea and comfort food. We found a parking spot a block or so away. No stroll this time. We hustled through a light drizzle, avoiding the puddles pooling on the streets. The term “hustle” post-stroke is, of course, applied to indicate faster than my current normal rather than actual speedy foot travel. The Goodlife Café and Bakery touted itself as an organic espresso and juice bar with homemade food. Our entrance into the café was pure pleasure. Warmth, both physical and emotional, welcomed us. A queue of congenial patrons studied the available food and drink while the enticing scents of freshly baked bread, pastries and breakfast and lunch offerings wafted around us. Hubby, left, joins the queue in the Goodlife. A latte for him and hot tea for me had us both warmed up and mellow. 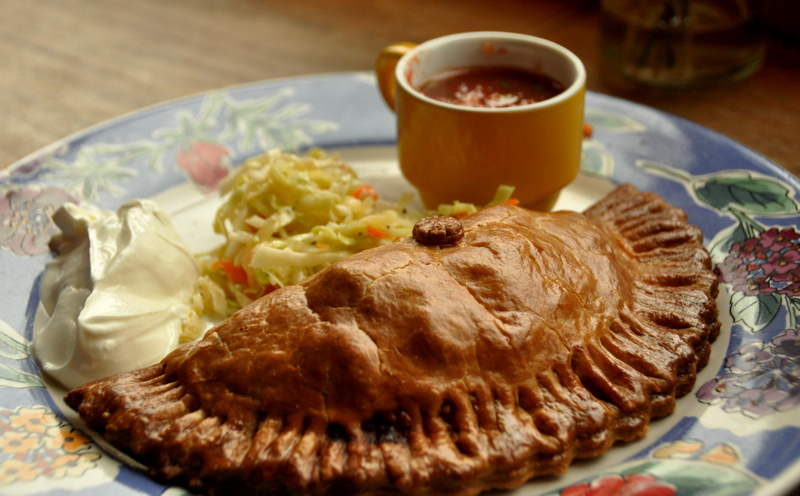 We split an empanada, the first we had ever seen, let alone tasted. The egg, cheese and sausage version we shared was delicious. The slaw that came with it was a fantastic combination of sweet, sour and crunch. 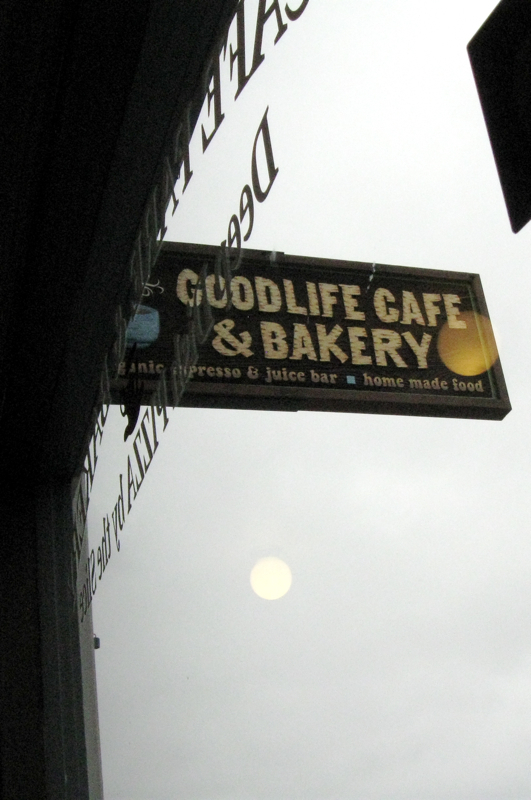 No sunshine outdoors, but definitely a sunny day for us inside the Goodlife Café and Bakery. What a nice respite from the cold rain. That meal looks delicious! What a wonderful place to warm up. The food looks delicious. I'm sure you had a great day! This looks wonderful! I don't think I have ever seen one either.